Take that night, for example. The exchange with Jeff was just the beginning. Of course I went over later to talk with Jeff and he introduced me to Beth and Adam. We chatted for a few minutes about my favorite topic, how good the band was. I told them I had a blog and Jeff told me I should write a post about that night. I mentioned that I had already posted twice about Johnny’s and The Earthtones and I wasn’t sure if I could write another post about how great the band. He was unmoved and said this post should happen and I could call it, “You Meet The Nicest People at Johnny’s,” so here it is. There are so many cool things about Johnny’s Pub and Grill. On the wall there is a countdown clock to St Patrick’s Day. At that moment it said 264 days, 5 hours, and 37 minutes until St. Paddy’s Day 2016. The walls are decorated with photographs, Beatles memorabilia, and all things Irish. There are always fascinating beers on tap and this trip I tried a couple of new flavors, continuing my summer of beer tasting (check out my previous post, 99 Bottles of Beer on the Wall), first an Anderson Valley Summer Solstice and then Galaxy White Dwarf Wit. I made friends with Cindy and Jim at the bar, who let me wiggle in so I could flag down the bartender. They didn’t really know the group but liked to come each month to listen to their music. As someone who follows bands I know, I love the fact that people come to see Eva, Brian, and Mike and they aren’t friends or relatives!! Joanie and Tim were also at the bar. Joanie came over to dance with us at one point and then we talked for a while. She is a singer and her dream is to get up on stage with the band and sing, but I told her I thought there was a long line, after Mark, and Jon, and Rusty, who do get the chance to perform with The Earthtones regularly. She spent most of the second set singing into my ear as she leaned over the back of my chair. One of the first times I went to Johnny’s to see the band, I was by myself leaning against a pillar, singing along to the music. A blonde woman approached me and asked if I wanted to join her at the front table. 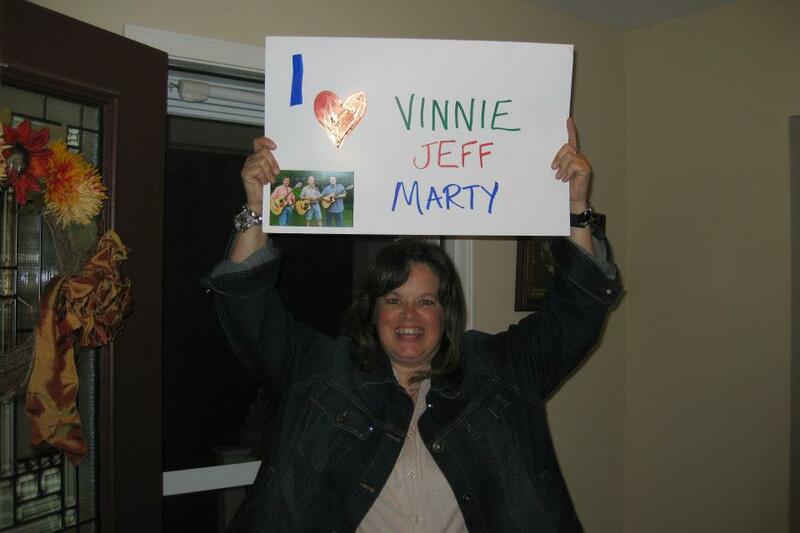 I declined, telling her I was practicing for my Halloween costume as a stalker for a band (here is a pic from a few weeks later in my stalker persona). She laughed and told me to come over if I changed my mind. During the break, Michael introduced me to the blonde, his sister Lyn! She and her boyfriend Jesse are now my constant companions at the bar. She is an even bigger Michael Walker fan than I am and we have the best time sitting in the front row! I know I have said this before, but it bears repeating. 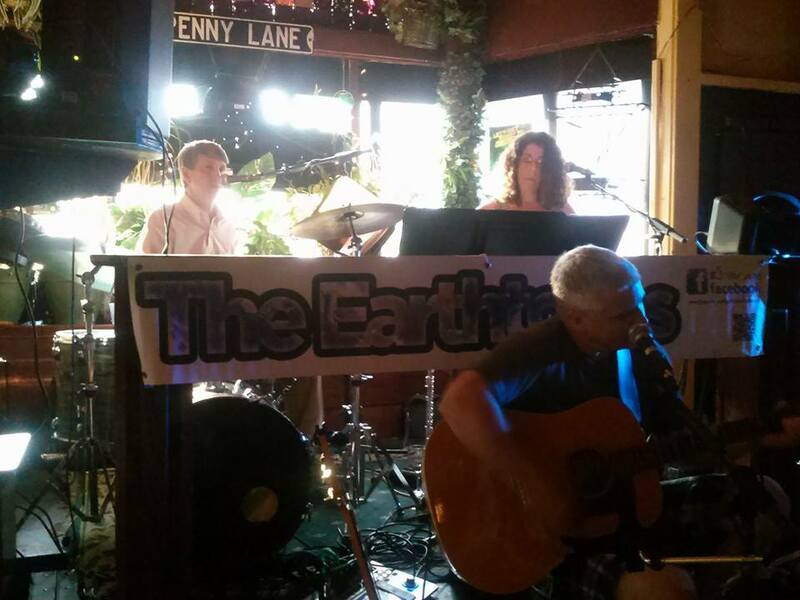 If you are ever in Rochester on the second Friday of the month (during the school year), head on over to Johnny’s Pub and Grill for happy hour and check out The Earthtones. More often than not, you will catch me at the front table!